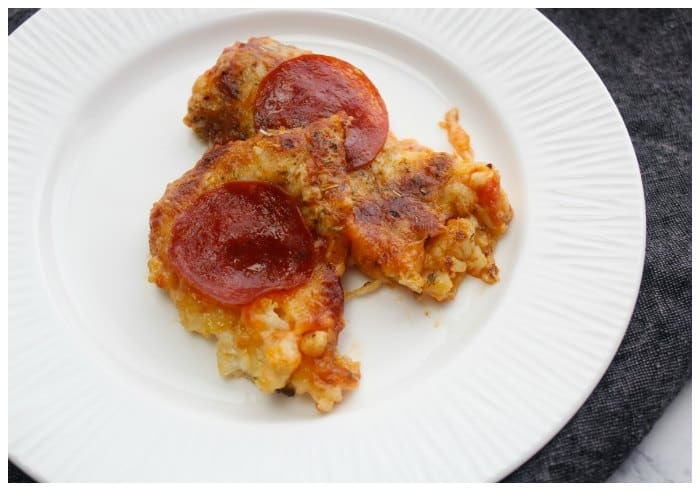 This Easy Keto Pizza Casserole Recipe is a fantastic dinner idea for anyone doing the Keto diet! It doesn’t take much to whip this dinner up either. You could even purchase the precut cauliflower bags they sell at Costco to make it that much easier. I’m going to show you how to make it with a full head of cauliflower though. I’ve down 50 lbs since starting the Keto diet! I’ve had friends ask if I will continue the Keto way of eating or convert to a Low Carb adjustment once I get to my goal weight and I’m not sure what I will do yet. I don’t have an issue with doing the Ketogenic Diet at all so I will probably continue with it. I don’t find it to be too restrictive at all. My body does amazingly well without the carbs and sugar. I have so much energy and I don’t have the bloated feeling anymore. It’s a great feeling! 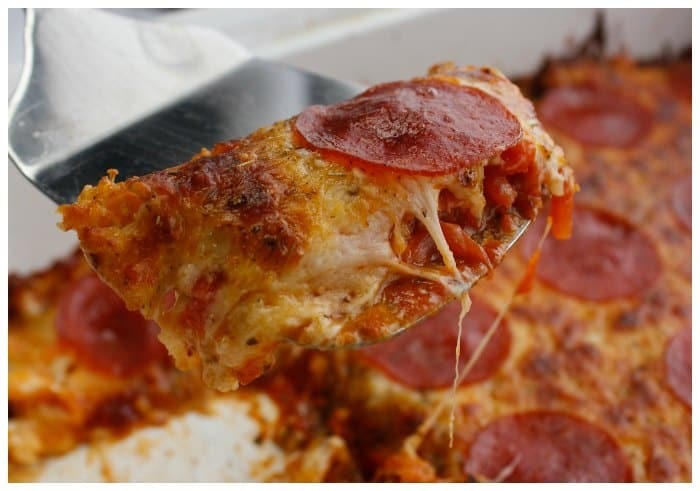 Recipes just like this pizza casserole are the reason I am able to stay successful! My parents have started the Keto diet and they have had huge success in a short amount of time too! My Dad is an extremely picky eater and yet, he’s added certain veggies in his diet that he would never have ever considered consuming before. If he can do it, you can too! He adds this Keto Alfredo sauce recipe to any veggie he doesn’t like. Whatever works, right? This recipe was inspired by our friends over at Wholesomeyum.com but we tweaked the recipe just a bit to make a thicker sauce and a few different seasonings. 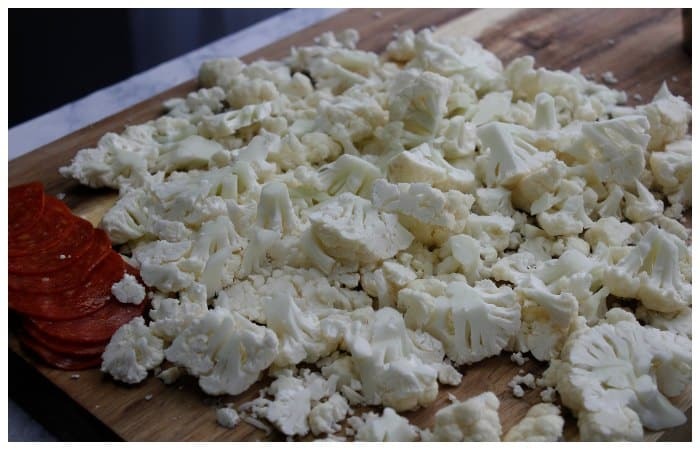 Cut up the cauliflower into small pieces. You can do this in a food processor or by hand. Costco also sells a package that's already pre-cut and ready to go. 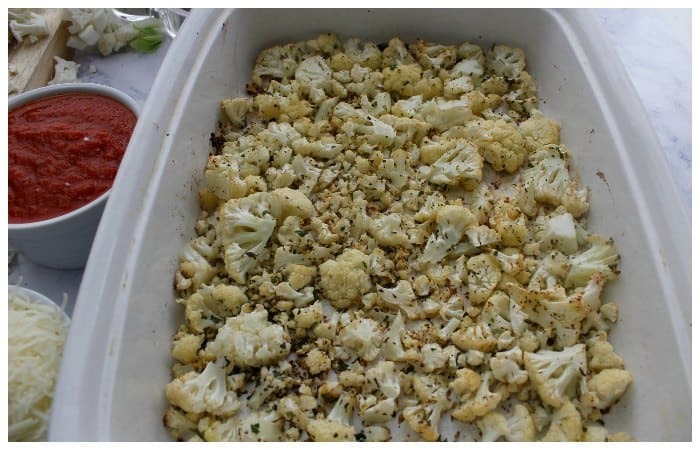 Place the cauliflower in a deep casserole dish and sprinkle with olive oil and all the seasonings. Bake the cauliflower at 400 degrees for about 20 minutes or until it's tender. The bigger the pieces the longer it will take to cook. Add one whipped egg to 1 cup of Rao's Marinara sauce. This will create an extra thick sauce to help the casserole stick together when it bakes. 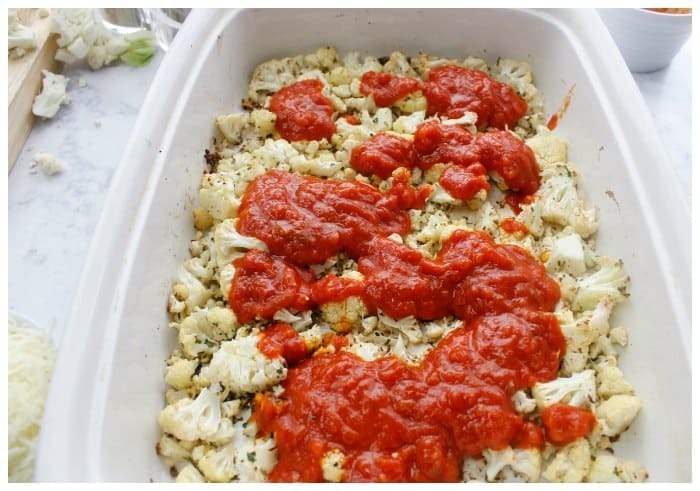 Pour the prepared sauce over the cooked cauliflower while it's still warm. 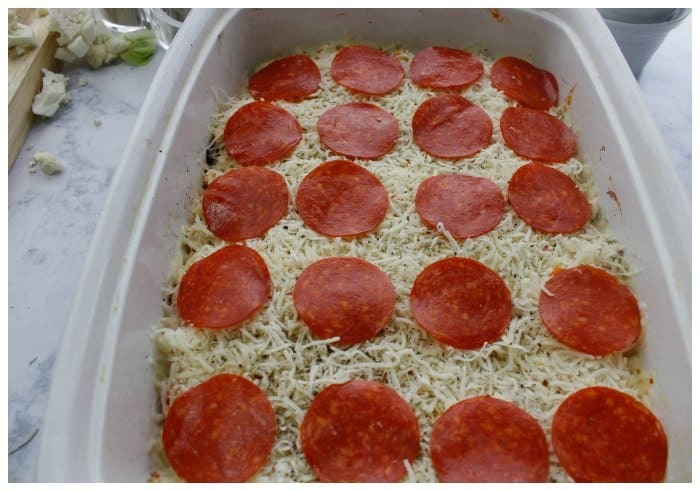 Add the cheese and additional toppings for your pizza casserole. Bake for another 10 minutes or so until all the cheese has melted and browned slightly. Cut up the cauliflower into small pieces. You can do this in a food processor or by hand. Costco also sells a package that’s already pre-cut and ready to go. Bake the cauliflower at 400 degrees for about 20 minutes or until it’s tender. The bigger the pieces the longer it will take to cook. Add one whipped egg to 1 cup of Rao’s Marinara sauce. This will create an extra thick sauce to help the casserole stick together when it bakes. 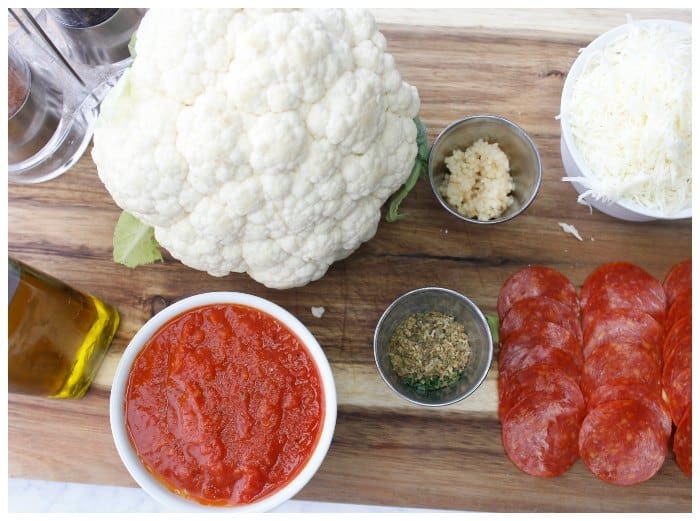 Pour the prepared sauce over the cooked cauliflower while it’s still warm. 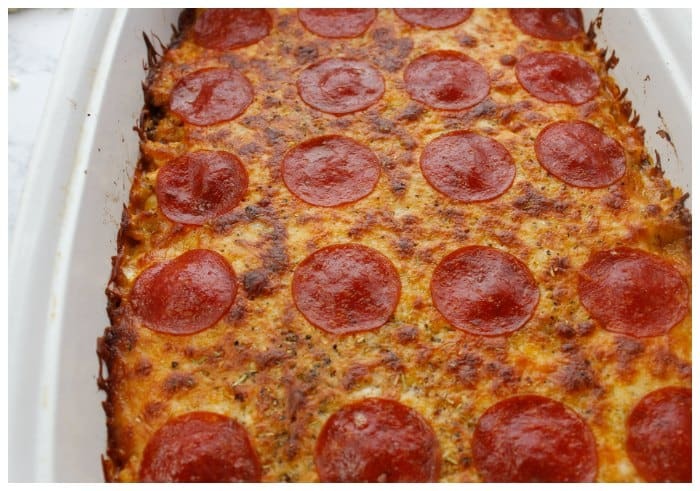 Don’t forget to pin this Easy Keto Pizza Casserole Recipe on Pinterest for later! 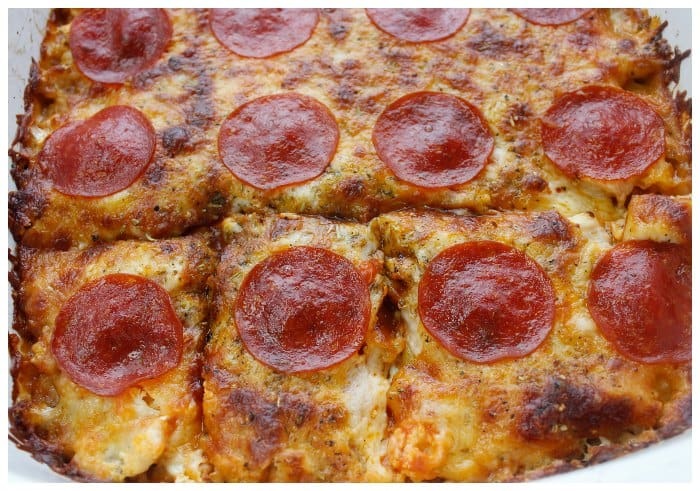 By Jennifer on March 7, 2016 Low Carb Recipes, Main Dishes, Pizza, Recipes, Weight Watchers. I just love your site. Not only great recipes but the print button is easier to find and has no advertising. Gonna check out more of your recipes.